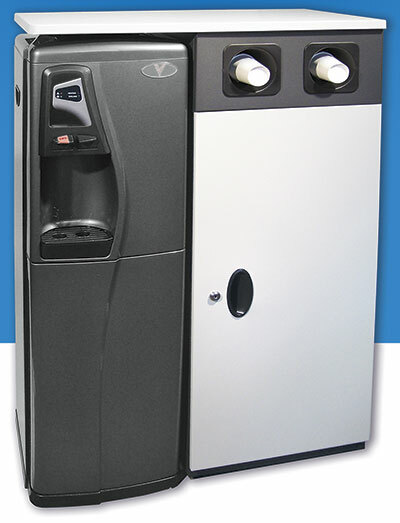 Create complete self-service beverage station. Create a self-serve refreshment station for a coffee brewer and a PureWaterCooler with this attractive 2-tone cabinet-stand. The sturdy powder coated steel cabinet has a matching ABS plastic work surface that is easy to clean and keep looking like new. The built-in cupholders offer convenience while the locking storage cabinet below can store extra cups, coffee and other sundries. Works with PWC-1500 and PWC-1800, and PWC-1000 on cooler stand. Cooler sold separately. Shipped partially assembled. These optional cooler stands add 6 inches in height and reduce bending and back strain while refilling. The PWC-1000 and PWC-1010 stands are made of sturdy plastic and specifically designed and molded to fit under cooler without assembly – they snap into place. 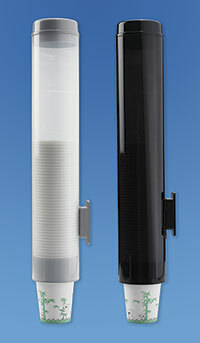 The PWC-2000 and PWC-3500 stands are black and made with recessed locating holes for secure mounting. Add convenience with these attractive cup holders that quickly attach to any floor standing cooler. Choose the color to match the cooler. Unit holds 50 count stack of 6 oz. cups.